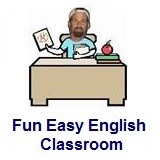 ﻿ Fun Easy English - new classroom free online classes english language lessons speaking listening writing reading september 21. Today in the Fun Easy English classroom you are going to learn "sorta" an American English reduction. What sorta book are you looking for? What sort of book are you looking for? What sorta car are you planning to buy? She might be sorta crazy. He might be sorta busy. What sorta girl are you looking for? What sorta things do you think about at night? 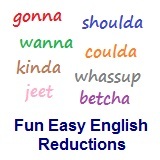 This American English reduction can be used in a variety of situations. For example you might ask someone who is sick if they are feeling better now. Howie: Hey Sandy are you feeling better now? Reductions, such as sorta are not real words in English.